A picture of the place in later years. Caleb Richard Crowder was born June 11, 1859, in Gentry County, MO to Wiley Martin Crowder and Mary Jane Johnson Crowder. On April 14, 1878, he married Lizzetta Freal Lagers, who was born February 22, 1860 in Nodaway County, MO to W. Barnhart and Mary Jane Johnson Lagers. 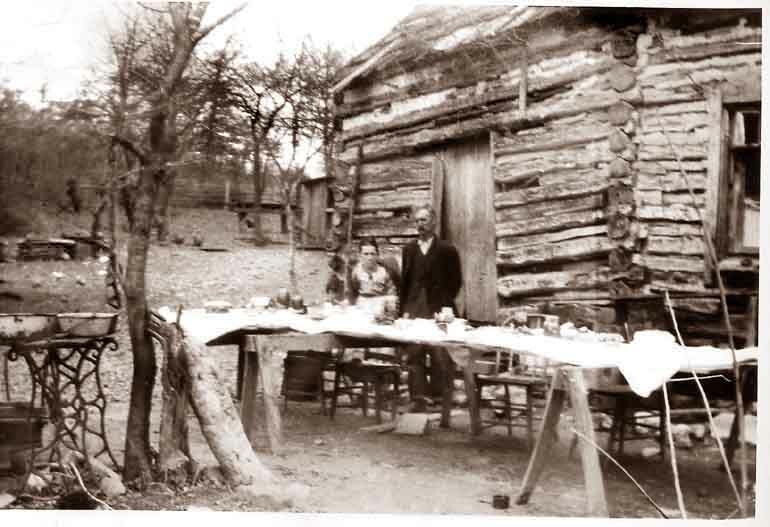 They were married in Gentry County where they lived until 1883, when they went South to McDonald County, MO, to homestead 40 acres between Tiff City and May. 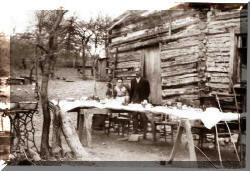 Before they left Gentry County, the had two children, Mary Jane in 1879, and Wiley Martin Barnhart in 1882. Life had to be hard for them, building a house, barn and outbuildings themselves, while raising a family. They continued to have children, Lucy Viola in 1884, John Manuel in 1886, Rosa Zetta in 1889, Lula Cinda in 1891, Ola Gertrude (My grandmother) in 1894, Sarah Margaret in 1897, and Delilah Roda Josephine in 1902. That should help explain the crowd around the table. Lucy and Ola married Maynard brothers, while John married their Maynard sister. That made for triple cousins. Lizzetta suffered greatly from osteoporosis, and she was bent nearly double before her death in 1933. These pictures must have been taken in the 'teens or early twenties, as Caleb died in 1927. My wife and I built our own house, with the help of a few friends. I have to say, I think it looks much better than the Crowder homestead. Of course, we had a few advantages like electricity, power tools, store bought nails, and lumber yards. And, of course, we would have built it cheaper if Ben's Used Lumber had still been in business! We have followed their lead by recycling a sewing machine frame. Ours is a T.V. stand in a bedroom. It has been a plant stand and an occasional table.